County Fair Game Review - Download and Play Free Version! Build and Manage a Highly Entertaining County Fair! Attractions, sounds, and sites of the county fair are very realistic making this game really fun and playable. Clearly labeled buttons and helpful advice make the game easy to learn and use. Each level brings about new objectives that are clearly explained and intriguing. Some objectives require you to wait for new attractions. This can be tedious and a time waster. The messages you receive from your staff on what needs to be done next can be overwhelming and annoying. The County Fair has Come to Town! You have been approached by Basil Brilig Attorney at Law who presents you with a letter from his client, Russ Pendleton. Mr. Pendleton is the founder and owner of a county fair empire which has fallen from popularity over the years. He has recently grown ill in his later years and has bequeathed all of his fortune and empire to his sole relative - you. With the help of Randal, your young but experienced fair employee, work to rebuild the fairs to their past glory and give one last gift to an old relative. 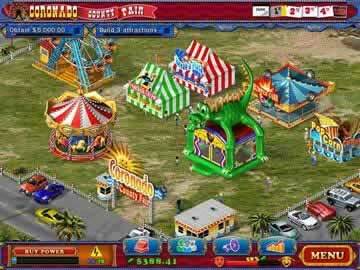 County Fair presents a fun and deep tycoon-type game where you have full control of building and maintaining a variety of cool amusement parks all over the country. 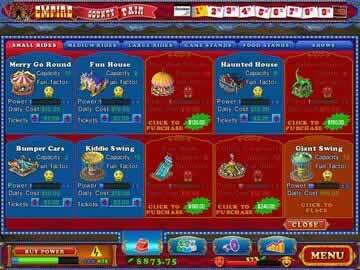 Your primary goal for each level is to come up with a certain income and complete any other goals, such as building particular rides or food venues, before the end of each fair, which usually only last a few days. In order to do this, you have to hire on the correct number of staff to take care of any problems, such as mechanics to build and repair rides or security guards to keep the peace. You also need to set the correct prices for everything from entrance ticket prices to how much each hot dog costs so that your popularity will grow and bring in more customers. With a whole slew of things to do and lots of building choices, County Fair provides gameplay which is both deep and involved yet easy to learn with a great tutorial for gamers new to the genre. It holds players interest as they progress through the levels by constantly adding new rides or stands with each level - there are over three dozen ride choices! With an assortment of upgrades for every building and the complete freedom to change prices, players can be flexible and make up their own strategies as they go along. 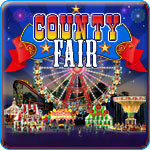 So, if you like tycoon-style games and family friendly carnival fun, download County Fair today! You have just inherited an empire of county fairs from a distant ailing relative. Foreclosure is just around the corner and it is your job to revive the fairs and build a strong business. County Fair is a unique tycoon game that allows you to manage resources and build a carnival in order to create a successful business. From ring toss to the ferris wheel, strong-man to the carousel, you are in complete control. As part of your inheritance you receive a small amount of start-up money before each fair. The fairs last approximately 3 days and it becomes your job to grow the money you are given. To do this you must hire a staff of mechanics, sanitation workers, health professionals, and security officers. With the help of this staff you must build a profitable county fair business. The game gives you the opportunity to set prices of not only the admission, but also each individual ride and stand. As the owner you are also in charge of marketing and advertising. You can put an ad in the newspaper, broadcast something on the radio, or create an commercial on TV. Marketing is a way to increase the attendance of your fair, however, too much advertising gets expensive. These lifelike elements of running a successful business through different facets makes this game a load of fun. The reality element keeps the game intriguing, especially for those interested in business and entrepreneurial games. As far as gameplay is concerned there are no complaints. The mouse controls all movements and the buttons are clearly labeled and explained. Graphically this game is superior. The rides are realistic and the animation is great. The sounds are also carnivalesque and make you feel as though you are actually at a county fair. Though there are no significant drawbacks, one element of the game that was somewhat frustrating was the waiting. Most of the levels require waiting for either money or attractions. This can become annoying. If the game had a “fast-forward” button this problem could be avoided. It's not a huge deal, but having all of a level's objectives complete and then being forced to wait for money can be tiring. Also, while playing you may feel bogged down with messages from your staff. This is helpful because they are giving you advice, however, the messages are constant. There are so many that it becomes rare to build a ride without at least 2 messages popping-up. Overall, County Fair is a fun carnival game with an interesting storyline that will get you hooked from the start. The graphics lifelike and sound quality is very reflective of a county fair. This game has a large upside, it's a simple tycoon game that allows players to create their own strategies. This game is a great simulation for all ages. It's has simple elements for a younger crowd, and the engaging strategy will keep older players intrigued. See how you too can build a successful fair with spectacular rides, entertaining game stands, and delicious concessions.